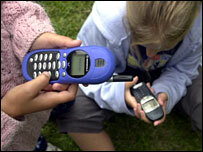 More than nine out of 10 12-year-olds in the UK now have a mobile phone, a survey has suggested. Almost 80% of the young people who took part in the research said they felt safer having a mobile and that they had a better social life as a result. On average, they send or receive up to 10 text messages a day - three times more than their parents. The Mobile Life Survey, commissioned by Carphone Warehouse, quizzed 1,250 people aged 11 to 17. The survey added that texting was the preferred method for youngsters to contact each other, rather than phone calls. And while many schools have banned mobile phones, 50% of those questioned admitted to sending or receiving a text during lessons. Furthermore, 78% of 11 to 17-year-olds believe having a mobile has given them a better social life as it meant it was easier to keep in touch with their friends. By contrast, many young people - especially teenage girls - admit they would feel unwanted if the day passed without their mobile ringing. Among those quizzed 26% said they would feel left out, compared with just 11% of parents. Three-quarters of youngsters have had their phone bought for them by their parents, while half have their calls paid for by their parents. The survey found that most parents (71%) believed mobiles were a useful way to keep track of their offspring. However, only a third of 13 to 16-year-olds thought it was reasonable for parents to use mobiles for this reason. One in three youngsters added that they use phones to keep in touch with people their parents did not want them to contact. As far as paying the bills go, parents shoulder most of the burden. According to a wider survey of 16,500 people, Carphone Warehouse found 45% of parents paid mobile bills for their child, 28% said their child paid the bill while 22% said they shared the cost with their child. A futher 5% said someone else paid the bill.